Speciality Mounting Hardware/Rivet Crush Nut and Security Bolts Add-on Required None Yes, Add Rivet Crush Nut Pkg. The NEW GEN 3 is a Boat lite lite that has been in development for the past two Years. When we set out to provide customers with a three light look, we quickly found it was more difficult to accomplish than we anticipated. With three lights pointing in differnt directions you will have a concentrated beam in three locations, making the areas in-between Dark. We had to develop a concentrated beam in the front with an equal beam following all the way to the sides, (similar to our GEN 1.2) . 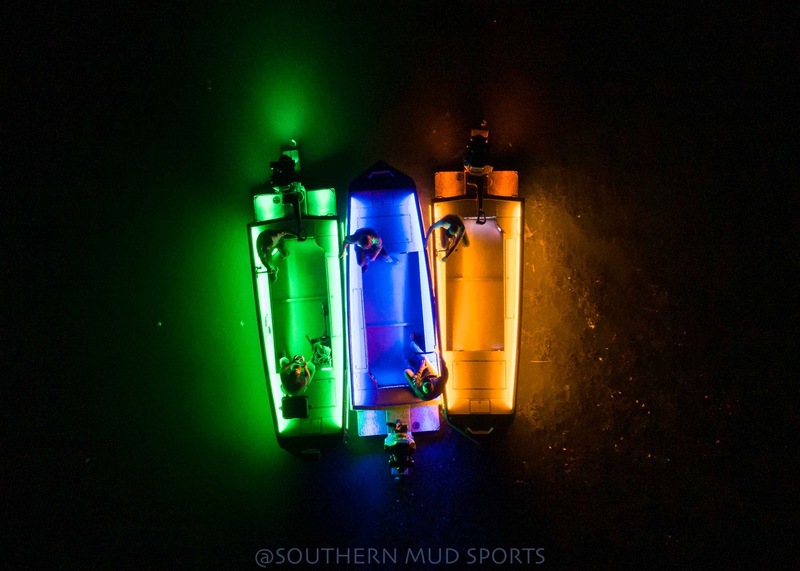 After months and months of testing on the WATER, we finally found the exact angles and diode projection that would qualify this light to be called a Southern lite LED BOAT LITE. THE GEN 3 WITH 220 DEGREE LIGHT PROJECTION is our widest shining light to date, with an actual rear projection shining back, not just toward the front. The GEN 3 also was designed to be extremely narrow so not to interfere with your trolling motor of take up the whole bow of your boat. The GEN 3 SLL BOAT LITE is GUARANTEED TO BE THE BRIGHTEST, TOUGHEST, AND LONGEST LASTING BOAT LITE of its size. THIS BOAT LIGHT HAS BEEN TESTED TO PERFORM IN REAL BOAT NAVIGATION CONDITIONS TO KEEP YOU SAFE OUT ON THE WATER. Just purchased a new boat after this past duck season and I decided to deck the whole thing out with SLL light from front to back. I started with the snake tube lights they offer for interior lighting and then also got the rooster tail lights in white for rear lighting. The interior lights are bright as can be. I only did 4’ strips so they didn’t run all the way to now and kinda glad that I did. They are plenty bright. The rooster tails I installed were going to mainly be used for backing up to ramps in secluded locations that has little to no lighting so I can see where I’m going and they work great! Light up around 20-30 yards and have a wide light output to then. To top it off a few weeks later I ordered the GEN 3 light bar and let me tell y’all. It is BRIGHT! Can’t wait to run the timber/rivers with it next year. They sure knew why they were doing when designing it. Light housing is nice and solid and the mounting hardware that comes with it is a must have. Took maybe 20 mins to install the light and the majority of it was getting my wire fished through the boat. I’m very pleased with the product and hope this is a helpful review for someone else out there! Thanks SLL for the great products for the outdoorsman. The absolute best light on the market! Does great on open water and On small rivers. The factory light on my excel would rattle and start rotating backwards in rough water and wasn’t half as bright as this light. Very well built product and with the crush nut mounting hardware this thing isn’t going anywhere! Will be a customer for life! Man, what an unbelievable product! I have had this light on my War Eagle for 6 months now and absolutely love it! It's is worth every penny! (The light does work on my 1648 War Eagle- installed on top rail of boat and you can put 5 of the 6 screwes in. If you have War Eagle's duck bill, it will attach at all 6 points) Also, I would highly recommend using the crush nuts for install, easy to use and provide a connection so sturdy you would swear it is welded to the boat. Southernlite LED also has the best customer service around. I somehow lost one of the screws when installing, called them up and asked if I could get a new one without having to buy the whole set... two days later it was in my mail box! GREAT PRODUCT FROM A FIRST CLASS COMPANY! Whoever doesn't have one on their Boat is crazy. Well worth the money, pictures and videos don't do it justice, stupid bright. Owned 7 boats over the last 5 years and have every lightbar across the market. Nothing has compared to the overall light spread and lumens of this gen 3. Wether I’m in the timber, river or marsh, I always have full visibility without the shadows and blind spots of my previous light bar. This thing is head and shoulders above anything else on the market. I'm not a bandwagon kind of guy. We tried multiple lights thinking all LED's are the same. The Gen 3 killed everything we compared it too! Lighting is one of the most important things when running a boat in those early mornings or late evenings. It doesn't get any better than Southern Lite LED!